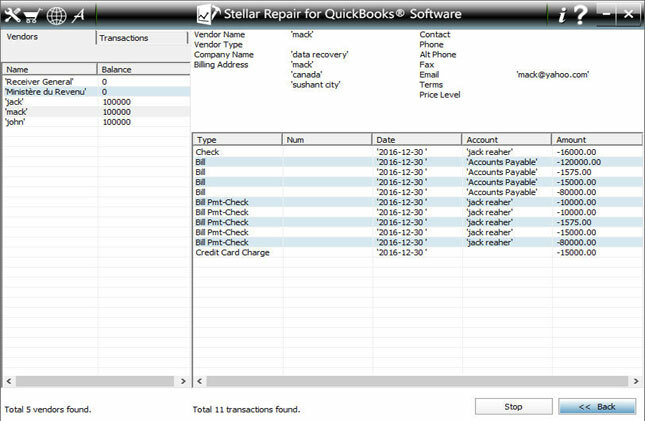 Stellar Repair for QuickBooks Software A professional tool, repairs severely damaged or corrupted QuickBooks? 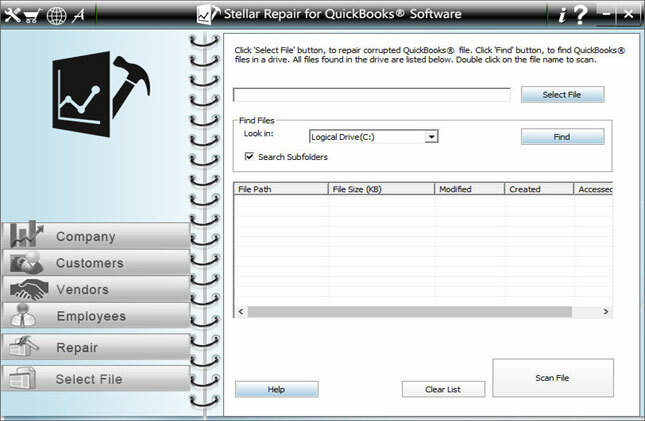 software data file (QBW) without hampering the QuickBooks® file components. 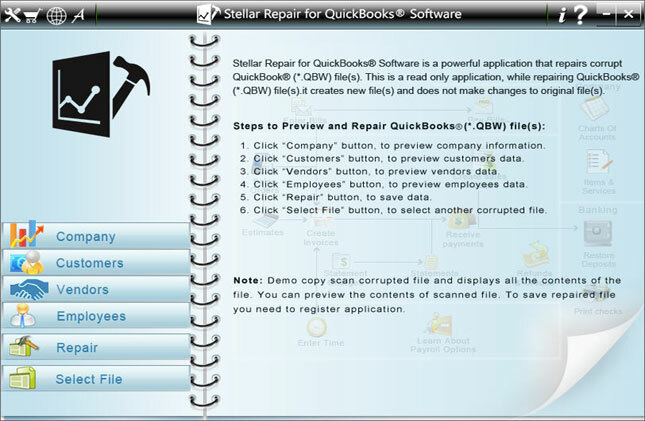 Further, it recovers all information of Customers, Company, Vendors, and Employees saved in QBW files. 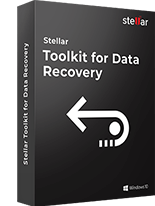 * Free download to preview the recoverable data. 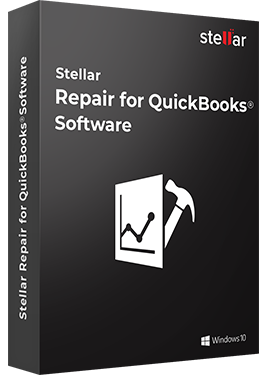 Stellar Repair for QuickBooks Software is fast, easy, efficient, and affordable utility to repair corrupt/inaccessible or damaged QuickBooks database (.qbw) files. This professional software recovers all the financial information related to customers, vendors, services, and employees. 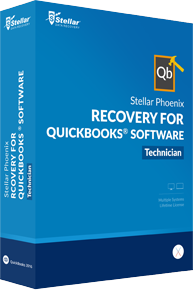 The well versed software supports recovery from various country editions of QuickBooks. The country specific editions of QuickBooks supported by this software are: Australia, Canada, Germany, New Zealand, South Africa, US, and UK. The tool has very intuitive user interface and facilitates you to select *.QBW file from your desired location. This feature works as a boon, when you do not know the location of your corrupt *.QBW file. Another advanced feature of the software is preview of recoverable items. 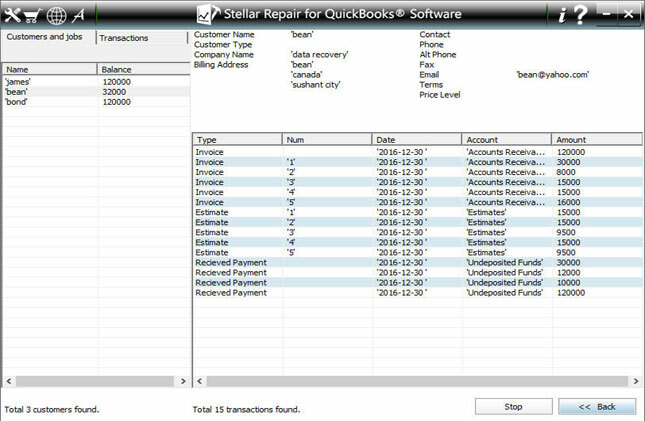 Through this feature, you can see the preview of various recoverable items of QuickBooks, such as the vendor information, employee information, employee transaction, etc on the interface of the software before recovering them actually. For any future reference, this tool provides a detailed Log Report. You can view and save this Log Report generated by the software. 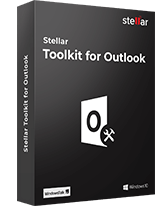 With all these features, this tool provides an easy option to update the software for latest updates from the software itself. 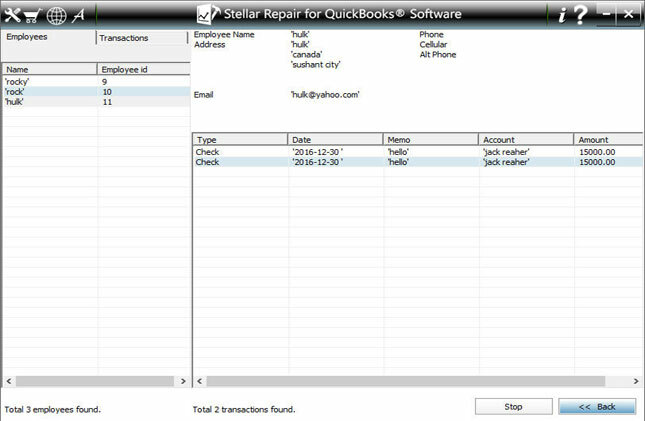 Therefore, by the easily understandable GUI of this software, you can recover all your precious QuickBooks information including Company Information and Transactions, Payroll Transactions and Paychecks, Employees Information and Transactions, and Customers Information and Transactions easily. The software is available in Administrator, Technician, and Academic Licenses. The Administrator license is for corporate or government segments. Technician license is for Data Recovery Service providers, repair and maintenance companies. Whereas, Academic license is for academic users. Therefore, you can select the license of this robust software according to your requirement. 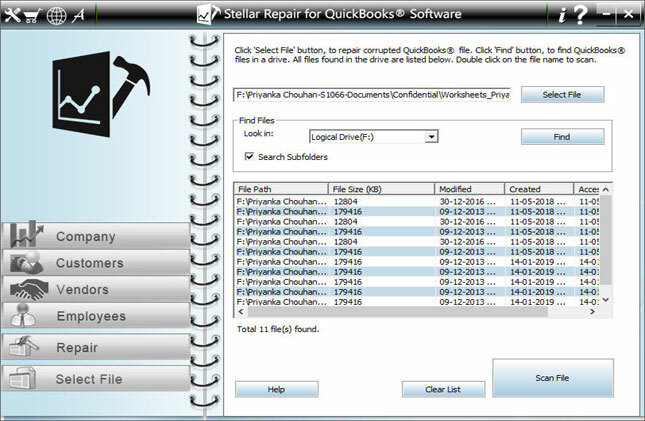 List of searched QuickBooks files from selected drive. Now choose your corrupt file and click on 'Scan File' button to start scanning process. After completion of scanning process, follow these instructions to see the preview of your data. Click on 'Browse' button, provide the location of new blank file that you have created, select QuickBooks version, and click on the 'Start' button to initiate the saving process. 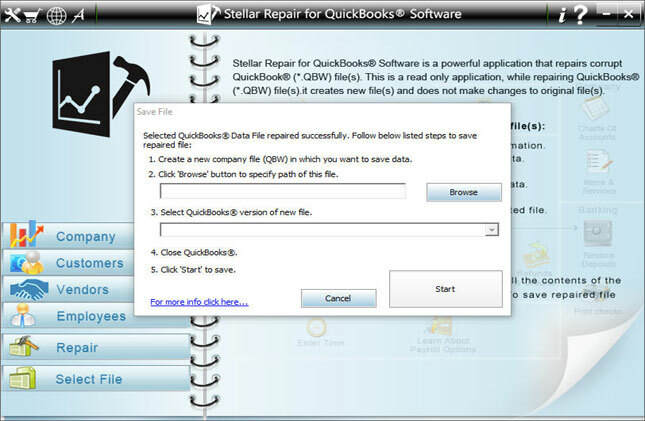 This software was able to repair and fix my corrupt.qbw file. After saving, I could see 100% of the items, invoices, received payments and purchase orders in the repaired file. Great software save my life ..Thanks.. 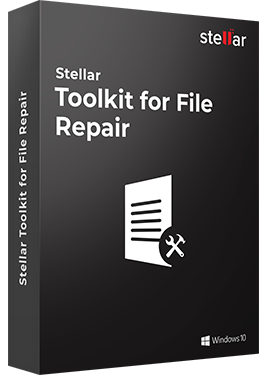 No accounting knowledge required to repair the file. 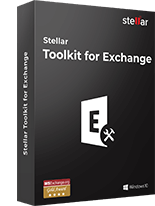 I repaired Employees transactions such as Paychecks, Liability Checks, Liability adjustments, Year-to-date adjustments with this tool. 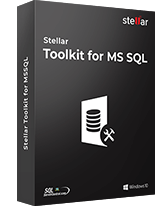 I just want to tell thanks to all the developers of this tool. You all are saving so many jobs and families. I am using QuickBooks from last 1 year and this is the first time with the corruption. 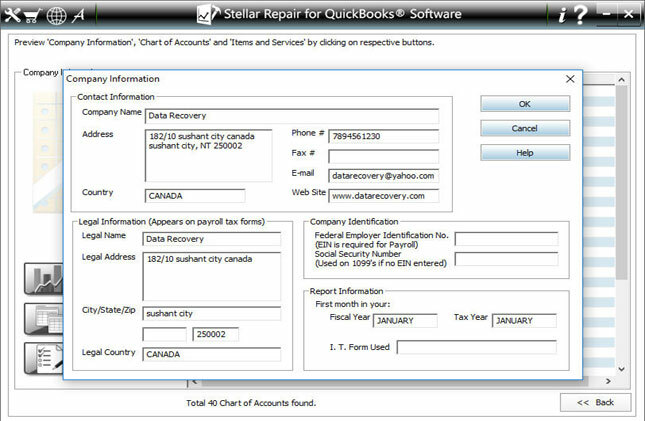 The software made the QuickBooks data file reopening is simple for every user who face the issue. 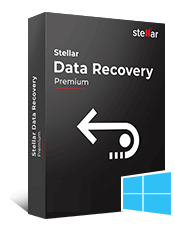 Repair your Word, Excel, PowerPoint documents with ease Stellar File Repair..
Recovers all important Customers, Vendor, and Employee information from..